The Islami Jamiat Tulaba, Punjab University, on Tuesday staged a protest demonstration against the government’s failure to arrest Awais Aqeel’s killers on the university campus bridge, leaving commuters high and dry. A day earlier (on May 4), the IJT announced it would go for a peaceful demonstration. 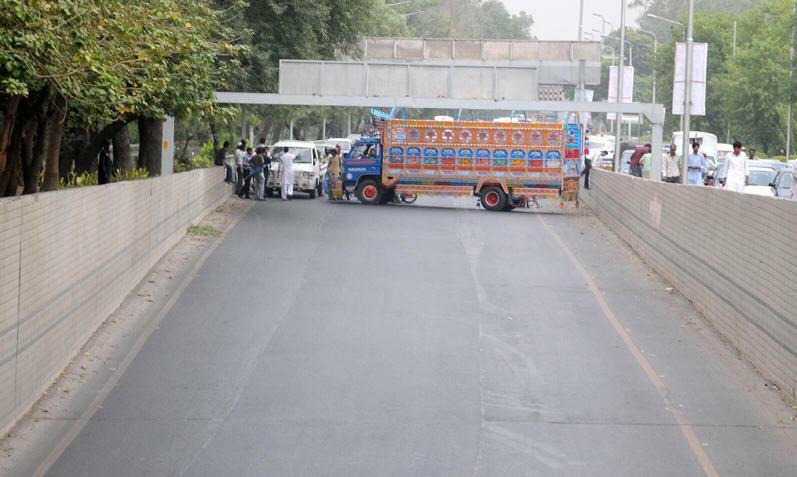 The IJT activists stopped the public transport buses, disembarked passengers and got the buses parked on Canal Road. They also burnt tyres and kept the road blocked for about two hours. Traffic coming from Thokhar Niaz Beg to Canal Road as well as from Garden Town and Bhekewal Morr towards Canal was choked. The buses’ passengers including women and children were forced to stand on the road and wait for the protest to conclude. The demonstration led by IJT Nazims Haris Saeed, Hafiz Nauman Zafar, Saqib Gujjar and Behram Saeed chanted slogans against the Punjab police and the PU administration for its failure to arrest Jamiat leader Awais Aqeel’s killers. They also demanded removal of the PU vice chancellor. Speaking to protesters, the IJT leaders said 20 days had passed but no killer had so far been arrested. They said the protest would be spread across Lahore and that now all decisions would be made on roads instead of courts. Hafiz Nauman Zafar said the PU vice chancellor’s silence over murder and registration of FIR was a matter of grave concern for the Jamiat.The Punjab government had recently set up a police post on the university premises but no one dared stop the IJT activists from taking law into their hands. For Merit Lists click here ! Last edited by Salman Mushtaq; 06-06-2012 at 02:11 PM. I don't know it is right or wrong but one thing i know that, this is creating lots of problems for the people..